In the course of the last five years, the committee have had the opportunity of observing a gradual reform of general prosperity and a constantly increasing extension of commerce. George Stephenson and James Walker (who were also involved with the Leeds & Selby scheme) were appointed as joint engineers. Two routes were proposed: Walker suggested a direct route of 37 miles, which would have involved considerable civil engineering, while Stephenson’s meandering Calder Valley route was easier but 13 miles longer. 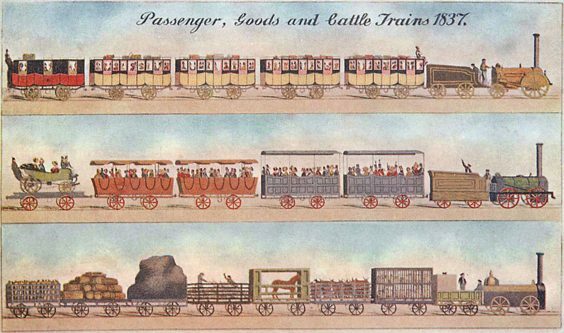 One correspondent to the Leeds Mercury (on 23 October 1830) thought Walker’s route better fulfilled the aims of the Manchester & Leeds Railway by ‘the formation of the shortest, and most direct communication between Liverpool, Manchester, Leeds and Hull’. For this reason, as well as the lower cost, Stephenson’s route was approved. A Bill for the Manchester & Leeds Railway was presented to Parliament on 10 March 1831, where despite the fierce opposition of the canal interests, it received a first and second reading. Its progress to committee was prevented by the dissolution of Parliament on 23 April. 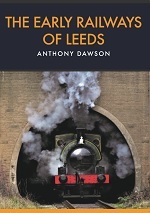 The Board then petitioned for their Bill to be reintroduced to the next session, only for it to be thrown out at committee because ‘the preamble for an Act … to build a railway between Manchester and Leeds had not been proved’. Once again the Board petitioned Parliament, but once again the Bill was thrown out, the case for the railway still not having been proved. And here the Manchester & Leeds remained for five years, until the whole parliamentary process began again in February 1836. 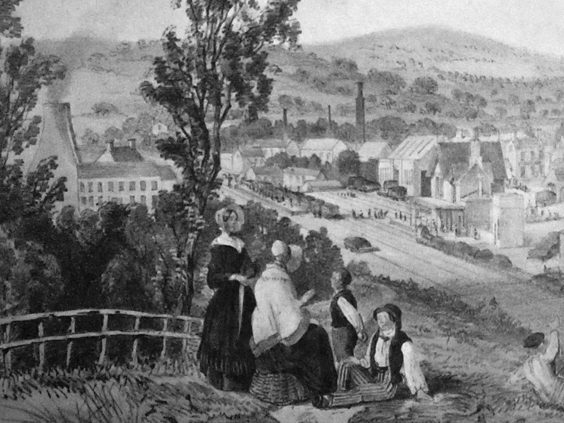 With an improved financial climate, no doubt thanks to the influx of slavery compensation money, and with railways such as the Liverpool & Manchester being such an obvious success, the Board of the Manchester & Leeds submitted a second Bill that, despite renewed opposition from the canal interest, received Royal Assent on 4 July 1836. The company was authorised to build its line from Oldham Road, Manchester, to a junction with the proposed North Midland Railway at the then obscure village of Normanton, 15 miles to the south-east of Leeds, which, thanks to George Hudson, would become an important early railway centre. The Manchester & Leeds Company was formally incorporated in 1836 and Directors were appointed at a General Meeting on 8 September 1836, ‘for the purpose of proceeding in the execution of the Act’. James Wood was elected as Chairman and Daniel Broadhurst at Secretary. Directors included: Thomas Broadbent (mill owner, Huddersfield), Henry Forth, Robert Gill, Henry Houldsworth (of Manchester, future Chairman), William Hayes, Aaron Lees, John Smith, James Wood, James Simpson, Richard Barrow Jnr., and the Hon. Captain T. Best. Among the proprietors was Thomas Potter of Hyde, a wealthy Unitarian cotton mill owner who would later be Chairman of the Manchester & Birmingham Railway. Tenders for the western section were invited during June 1837 and those for the eastern section – Summit Tunnel at Littleborough being the dividing line – in May 1838. Thomas Longridge Gooch was appointed as Resident Engineer, having cut his engineering teeth (so to speak) while working under George Stephenson on the Liverpool & Manchester. Gooch had been apprenticed to Robert Stephenson & Co. at their Forth Street Works, Newcastle, aged ‘not quite fifteen’ in 1823, and after two years in the workshops, progressed to the drawing office, where he became a talented draughtsman and surveyor. 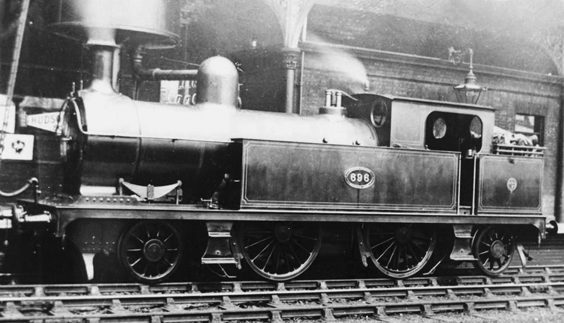 He was appointed as senior draughtsman and private secretary to Stephenson senior aged only twenty-two, with the two working side-by-side on the Liverpool & Manchester project. He was one of the pleasantest men possible to be associated with, always genial, and of a very social and friendly disposition; he was, too … of a musical turn, and used to indulge in sentimental songs … in an evening. 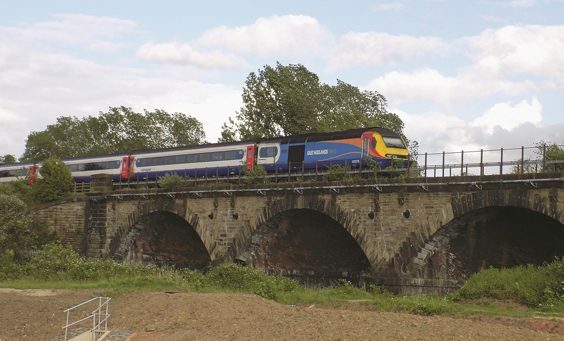 There was considerable opposition to the railway, not only from the canal interests, but from landowners and even towns, which were reluctant to have a railway pass through them. The jury, after nearly and hour’s consultation, gave their verdict … land and buildings and timber, £1,191 10s 6d; severance, including £55 mill damages, £215. Samuel Turner of Sowerby Bridge claimed £1,500 from the company in compensation for ‘a valuable stone quarry’ affected by the route of the line, but the company offered £500 (the value of the land). Again the dispute went to court, and the jury decided that the company should only pay Turner £475, and that Turner had to pay the costs. The townsfolk of Wakefield – no doubt goaded by the Aire & Calder Navigation Co. – attempted to prevent the passage of the railway close to the town in tandem with the local aristocracy, who were implacably opposed to the M&L. In May 1838 there were disputes over land in Thornes (just south of the town) and Kirkthorpe (to the east). The matter ending up in court, the jury found in favour of the railway, much to the fury of the local press. The Aire and Calder Company, who had been up to this time almost invincible, stoutly opposed the construction of the line … and actually obtained an injunction  from the Court of Chancery to stop the works. The ground on which this order was granted was a clause in the Railway Company’s Act, that the said important street should be crossed by means of a viaduct. The Aire and Calder Company contended that this implied an opening over the entire width of the street; the Railway Company … insisted on their right to build two piers in the street forming one large opening for carriages, and a smaller one on each side for foot-passengers. The case went before Judges in London, who sent it down to be tried at York before a special Jury. Matters became so heated that some of the infuriated townsfolk expected the company to demolish the viaduct. The York jury found in favour of the M&L, but the Aire & Calder Company had been so sure of their success in court that ‘a sumptuous dinner had been ordered in anticipation of their victory’, which was eventually eaten by the M&L party, who ‘enjoy[ed] the good things provided for [their] opponents’! The station at Wakefield was built at Kirkgate, on a plot formerly occupied by strawberry fields and Joseph Aspdin’s cement works, where he produced his patent ‘Portland Cement’. It was opened on 5 October 1840. In the station approach was built the Wakefield Arms Hotel – using Aspdin’s cement – to provide passengers on the M&L at Wakefield with refreshment, meals, beds and ‘good stabling’. 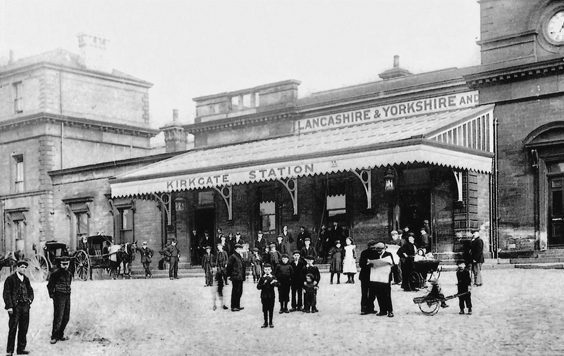 The original timber station was replaced by a magnificent stone building in 1854, built as a joint station by the Lancashire & Yorkshire and the Great Northern. 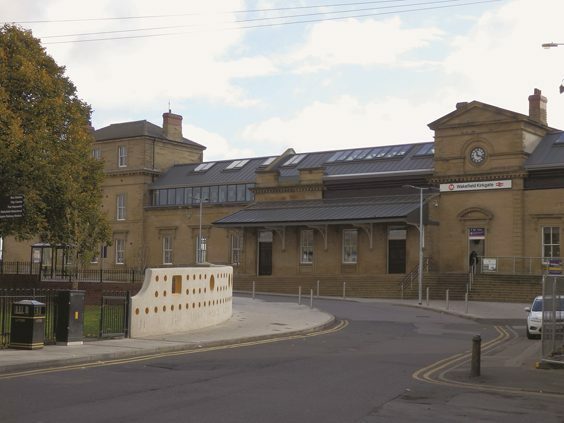 After many years of neglect, Wakefield Kirkgate was restored from 2013 to 2015 at a cost of £4 million to breathe new life into the building, which had been unmanned, unsafe and virtually derelict since the 1970s (despite being the larger of Wakefield’s two stations). Between November 1839 and March 1840 there was a court injunction halting the railway works at Healey Mills, about a mile west of Horbury. The M&L Act empowered it to divert the Calder but not to interfere with the supply of water to nearby business, including the scribbling mill at Healey New Mill (now a Grade II listed building). Benjamin Hallas, owner of New Mill, claimed that the diversion of the Calder had left ‘the … mill entirely dry’, and furthermore the access road had been diverted and reduced in width (from 15 feet to 11), so that it was now unsuitable to transport bulky cargos of wool to and from the mill. Finally, a decision was reached in favour of the M&L in early March 1840, when the Lord Chancellor dissolved the injunction. The Aire & Calder Company’s opposition to the M&L kept their respective lawyers busy for years. The M&L announced it was to cross the Calder at Broad Reach, where the Calder meanders considerably, and under its Act the M&L had powers to divert the river. The M&L announced in January 1839 that it was to divert the route of the river ‘near to Kirkthorpe, in the parishes of Warmfield and Wakefield’. 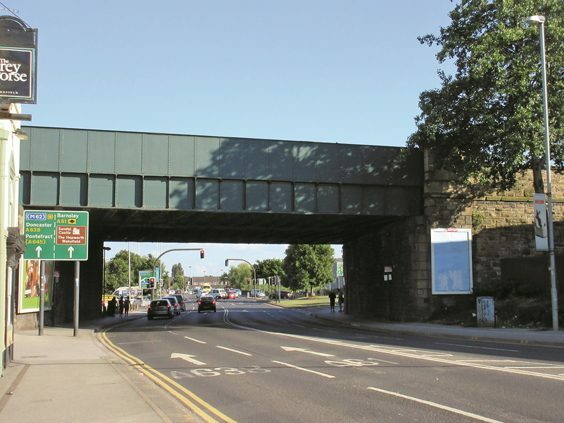 It was initially planned to cross the Calder by three bridges, but to reduce the cost of building the railway a single three-arch skew bridge and embankment were proposed instead. This change of plan required the re-routing of the Calder, which was blocked by several wealthy Wakefield landowners, claiming that the plans for this work had not been submitted to the Navigation Company for perusal. As a result, the court had a stop placed on the work yet again. The railway company eventually paid some £12,352 to the canal interests to enable the diversion of the Calder at Broad Reach and to enable their work to continue. Despite this, however, when the company erected a temporary bridge crossing the Calder in March 1840, the Aire & Calder people fought back, claiming it would interfere with boats plying the river. The diversion of the Calder required the excavation of a ‘new cut’, which considerably straightened and shortened the river at this point, and as a result should have been favoured by the canal interests. Despite all the expensive legal ramifications, the ‘new cut’ was ultimately of little use, as the Aire & Calder Navigation had opened its own cut between Broad Reach and Stanley Ferry, effectively bypassing the one dug by the railway. This new cut was opened on 15 March 1839 and involved the construction of an iron aqueduct at Stanley Ferry (described as ‘perhaps England’s least well-known canal structure of any significance’), which was built under the Aire & Calder Co.’s Act of 1828. The first boat to cross the new aqueduct was the schooner James, which had been built in Wakefield.